Apollo 11 Commander Neil Armstrong working at an equipment storage area on the lunar module. It’s a little over eight years since the flights of Yuri Gagarin and Alan Shepard, followed quickly by President Kennedy’s challenge to put a man on the moon before the decade is out. It is only seven months since NASA’s made a bold decision to send Apollo 8 all the way to the moon on the first manned flight of the massive Saturn V rocket. Now, on the morning of July 16, Apollo 11 astronauts Neil Armstrong, Buzz Aldrin and Michael Collins sit atop another Saturn V at Launch Complex 39A at the Kennedy Space Center. 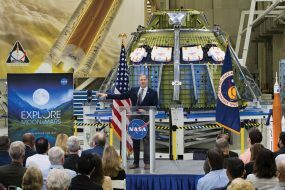 The three-stage 363-foot rocket will use its 7.5 million pounds of thrust to propel them into space and into history. At 9:32 a.m. EDT, the engines fire and Apollo 11 clears the tower. About 12 minutes later, the crew is in Earth orbit. After one and a half orbits, Apollo 11 gets a “go” for what mission controllers call “Translunar Injection” — in other words, it’s time to head for the moon. 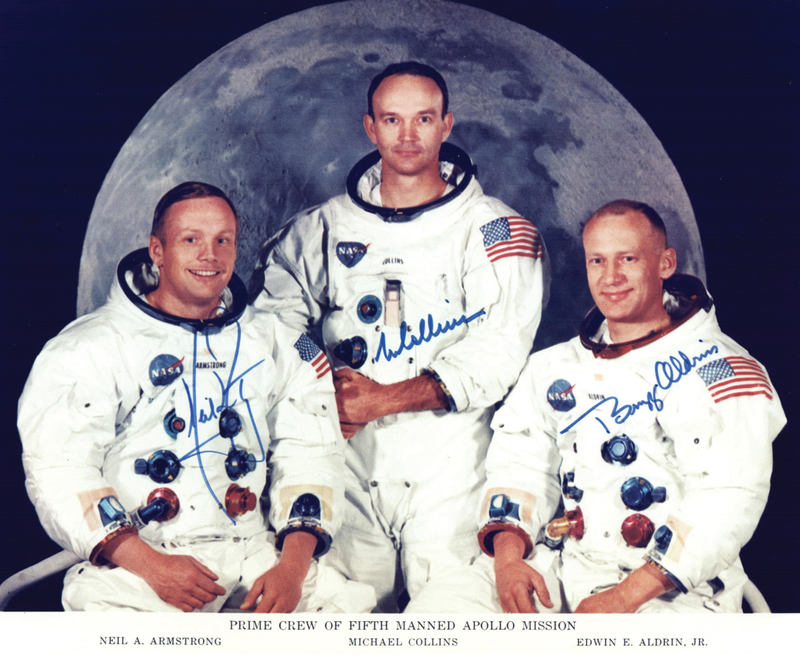 Three days later the crew is in lunar orbit. A day after that, Armstrong and Aldrin climb into the lunar module Eagle and begin the descent, while Collins orbits in the command module Columbia. Collins later writes that Eagle is “the weirdest looking contraption I have ever seen in the sky,” but it will prove its worth. When it comes time to set Eagle down in the Sea of Tranquility, Armstrong improvises, manually piloting the ship past an area littered with boulders. During the final seconds of descent, Eagle’s computer is sounding alarms. At 10:56 p.m. EDT Armstrong is ready to plant the first human foot on another world. 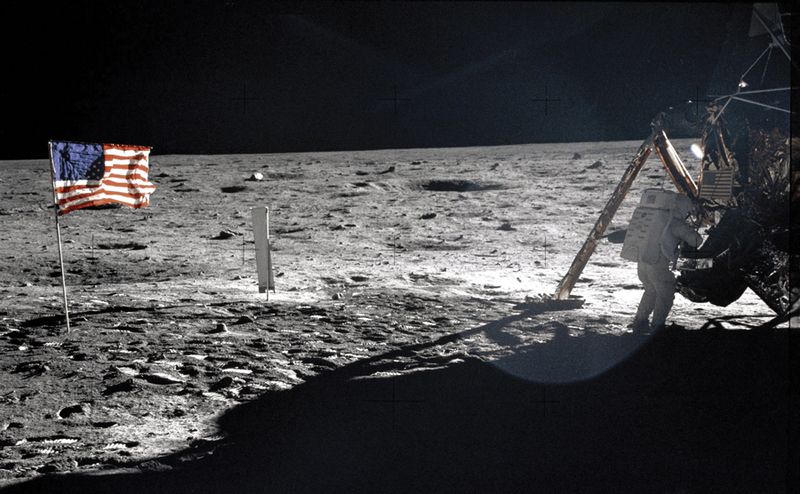 With more than half a billion people watching on television, he climbs down the ladder and proclaims: “That’s one small step for a man, one giant leap for mankind.” Aldrin joins him shortly, and offers a simple but powerful description of the lunar surface: “magnificent desolation.” They explore the surface for two and a half hours, collecting samples and taking photographs. The crew splashes down off Hawaii on July 24. Kennedy’s challenge has been met. Men from Earth have walked on the moon and returned safely home. In a post-flight press conference, Armstrong calls the flight “a beginning of a new age,” while Collins talks about future journeys to Mars.